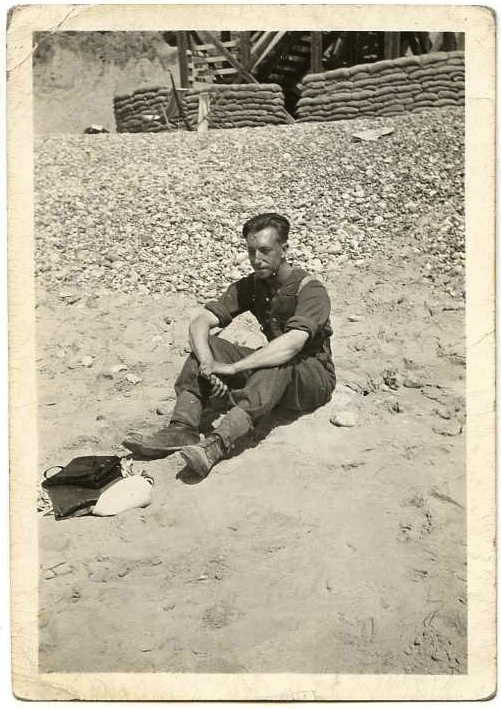 From his first camp at Towner Road, Des was among the many POWs working around Singapore to clear up and salvage damaged equipment for the Japanese war effort. Later moved to Changi gaol, Des joined working parties which among other tasks were required to clear swamp country to build an airfield, on the site of the current Changi International Airport. One work party had the task of breaking up damaged vehicles into spare parts, sometimes with totally inappropriate tools. Acts of minor sabotage were carried out at great risk, and some cheeky but risky activities undertaken which, to the benefit of the prisoners, took advantage of the perceived gullibility of poorly-educated Japanese guards, such as obtaining petrol from stores for use in a steam-powered road roller, then trading the petrol on the black market for food. They also managed to sabotage a Japanese war memorial by seeding the timber flagpole with termites. In fact, even ‘innocent’ artwork he produced was at the risk of loosing his own life, any prisoner found to be in the possession of writing materials were subjected to extreme forms of punishment, as the making of drawings or records of any kind was strictly forbidden by the Japanese. Des’s survival of the years of incarceration was in no small part due to his not being sent to work on the notorious Burma railway, which claimed the lives of some 16,000 allied POWs and a much greater number of forced labour Asian workers. Des was repatriated to England on the SS Monowai and arrived home in late September 1945 to find that his only brother had perished when his submarine the HMS ‘Vandal’ sank off Scotland while on trials, with the loss of all crew. It was finally discovered in 1994 and designated an official war grave. He had married Irene Kay in 1946, and, disillusioned by the way politics was affecting art education in England, emigrated to Australia in 1958 with Irene and his three children. One wonders what influence his fellow Aussie POWs with their carefree attitude, may have had on Des making this decision to move to Australia. Arriving from an English winter to a very hot South Australia in February, his first art teaching post was at the technical high school in Whyalla, on the edge of the desert. After several months he was transferred to the South Australian School of Art in Adelaide, rising to the position of Assistant Principal and finally Acting Principal before retiring in 1978. He seldom spoke about his wartime experiences. 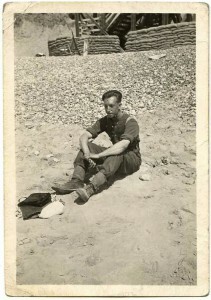 His children were aware of the album of sketches, and an envelope full of theatre programmes, which he kept in his wardrobe, but it was only in 1995, on the 50th anniversary of the end of the war, that he spoke in more detail about his life as an artilleryman and a POW, having re-met two colleagues from the 88th Field Regiment living in Australia, and rediscovered a series of lost artworks which went missing at the end of the war. At this time he was also asked if some of his artwork could be published in a book commemorating 50 years since end world war 2 ‘Their Sacrifice: Australia Remembers 1945 – 1995’, by Rob Linn. Later, in 1999, some of his work appeared in a regimental history by Dr. Stephen Bull ‘Lancashire Gunners at War: The 88th Field Regiment, 1939 – 1945’. Other publications incorporating work by Des. Four years earlier, Des had written a brief summary of his time as a POW, as a response to a request from the Singapore Tourism Promotion Board, who were preparing to commemorate the 50th anniversary of the Battle for Singapore. This document is available here. Des died in 2000 at the age of 81. This website was developed by his two sons and daughter as a dedication to his talent and to the other POWs who suffered through this terrible period of history. The background stories to his artwork and people he drew died with him. We would encourage people who can add some light on any of the artwork to make these known on this comments page. Please quote the particular piece you are referring to when commenting. Basically, Des painted and drew to maintain his sanity in such a cruel, unforgiving environment. We are aware that he gave a lot of his work away to ‘mates’ during captivity or after release. If you do have one of his pieces could you let us know, by using the contact or comments to enable us to get a scan of the work and in doing so, we can keep the website alive and active?